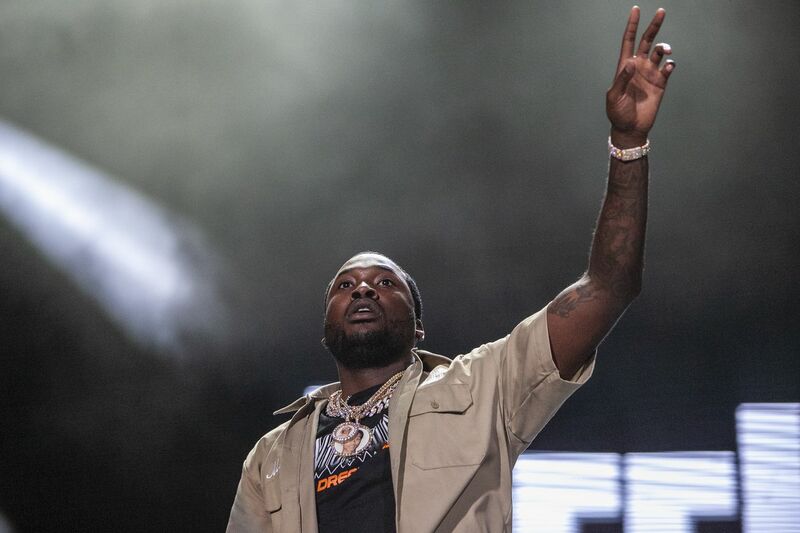 Meek Mill had to celebrate the Eagles 41-33 victory over the New England Patriots in Super Bowl LII in prison. Back in February, the Philadelphia rapper was serving a 2 to 4 year sentence for parole violations in relation to a 2007 drug and gun charge that was handed down in November. The team came on to the field to the sound of Mill's "Dreams & Nightmares," the 2011 track that both the Eagles and Sixers used as a hype song last year, and which marked the climax of Mill's homecoming set at the Made in America festival last week. When Mill got out of jail on bail in April — his case is currently under appeal — the rapper who has become a symbol of the criminal justice reform movement in the U.S. got a helicopter ride with his billionaire buddy and impassioned advocate Michael Rubin so they could make it in time to a Sixers playoff game, where he sat courtside with Rubin, who's a minority owner of the team, and Eagles owner Jeffrey Lurie. Tonight, as the Eagles kick off the NFL season at Lincoln Financial Field against the Atlanta Falcons, Mill, Rubin and Lurie will be watching together again, this time from Lurie's owner's box, according to a source close to Mill. It'll certainly be a more comfortable atmosphere for the Wins & Losses rapper than the State Correctional Institute — Chester where Mill last watched his Birds. And a high profile one as well, with the game that will be nationally televised on Comcast-owned NBC scheduled to feature a Nike commercial featuring Colin Kaepernick, the former San Francisco 49ers quarterback. The new face of the sneaker company's 30th anniversary Just Do It campaign's take-a-knee protests against police killings and injustice suffered by minorities during the playing of the National Anthem at games when he was still in the league have been decried by President Trump and others, and sparked a heated dialogue that has played out all over the league, and especially in the Eagles locker room, where athlete activists like safety Malcolm Jenkins and defensive end Chris Long stood in solidarity with Kaepernick last season (without actually kneeling during the anthem). Mill, who plans to launch a criminal justice reform foundation with Rubin, joined Kaepernick's #10for10 challenge earlier this year in each donating $10,000 to Youth Services, Inc. which aid at-risk youth in Philadelphia and other urban centers. The rapper — who has an endorsement deal with Puma, and an ad campaign that addresses criminal justice reform — spoke with the quarterback when he was in prison.